Shoes: Store or Display? | The House of Martins The House of Martins: Shoes: Store or Display? Back in April I posted about a Ottoman Shoe Storage - and now I found an equally interesting option for displaying your shoe collection. Over on the blog The Eclectic Life she shows us three ways to use a vintage ladder as part of your decor - and I must say the heels one got my attention. 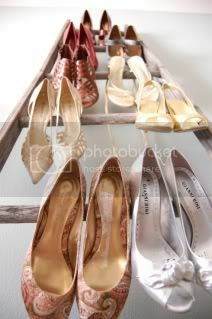 I think it would be neat to have an old ladder leaning next to my closet displaying all my colorful heels. Although I'm only 5'3'' (barely) and worry about needing another ladder to reach the ones on the top! Not sure if my husband would go for this idea - but I love it just the same. Of course, this has now added another thing to search for on ebay and at estate sales. A quick search on ebay leads me to this vintage style Mill Ladder - which now I also must have (for less money) to use as a bookcase. I feel a slight ladder obsession coming on. Anyone else have any good uses for vintage ladders? ellen check out the "folding library shelf" over at urbanoutfitters.com, it's comparable to the piece you have your eye on at ebay but about $100 less :) great blog! Oh wow! Its almost the exact same thing. Thanks for sharing that Cecilia!